stunning repartee with the cast second to none. He also handles the often potential car crash that is the traditional kids on stage moment with aplomb and shows his nifty piano skills during an inspired Elton John moment. He has the longest bio in the programme, and that is saying something considering his co-stars, however, it is clear from this performance that every line is warranted, and clearly richly deserved, as he provides, perhaps old-fashioned (and there is nothing wrong with that now and again), but stunning entertainment. The rest of the cast at times play second fiddle to his antics but put in some excellent performances of their own as well. 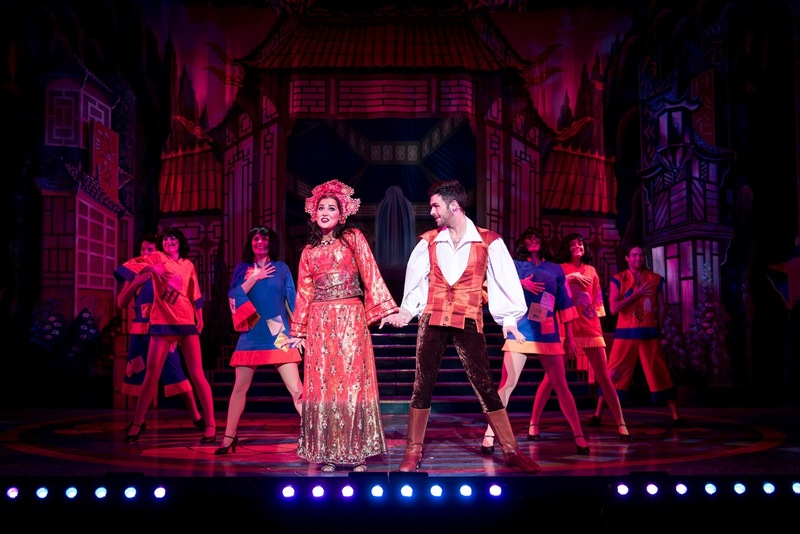 Both Jaymi Hensley as Aladdin and Zoe George as Princess Jasmine give assured offerings as the lead love interests, looking perfect together and performing a couple of lovely little duets. They canter perfectly to the needs of the younger members of the audience. The older members of that audience, however, are perhaps a little shortchanged at present, with the two for the mums and dads (and like me. Yes, I remember Just Good Friends!) not quite gelling as a partnership. It's true that poor Paul Nicholas' (Abanazar) big opening was stolen from him when his microphone failed to make an appearance, and I am unsure whether he totally appreciated all of Sheila Ferguson's (Scheherazade) adlibbing regarding his mic failure (which she did play with too long I feel). I like to think that he was trying to stay in character myself. Either way, I don't quite feel that this partnership is quite working yet, but these are experienced professionals, so I suspect this duo of good and evil will come good very soon as performances build. 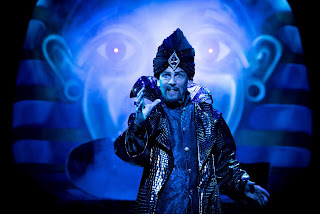 As it is, Nicholas makes a perhaps too nice baddie, even for a panto, however, he has a few great moments, not least his rather unexpected beatboxing gangster moment, which was a extremely pleasant delight. Ferguson, meanwhile, as expected provides the strongest vocals of the show, while otherwise being an occasional foil for Nicholas. There is no question that her moment is belting out Ain't No Mountain High Enough and managing not to be upstaged by Aladdin's rather nifty flying carpet. I really enjoyed Dom Hartley-Harris as Emporer Ming, a perfectly cast and very nicely played performance and showing some nifty moves like the rest of the cast. This is a very well choreographed piece as well, all the music sequences have been provided with a full of a fun collection of routines and the young cast members, from Mayhew School of Dance, are enthusiastic in their substantial number of appearances. 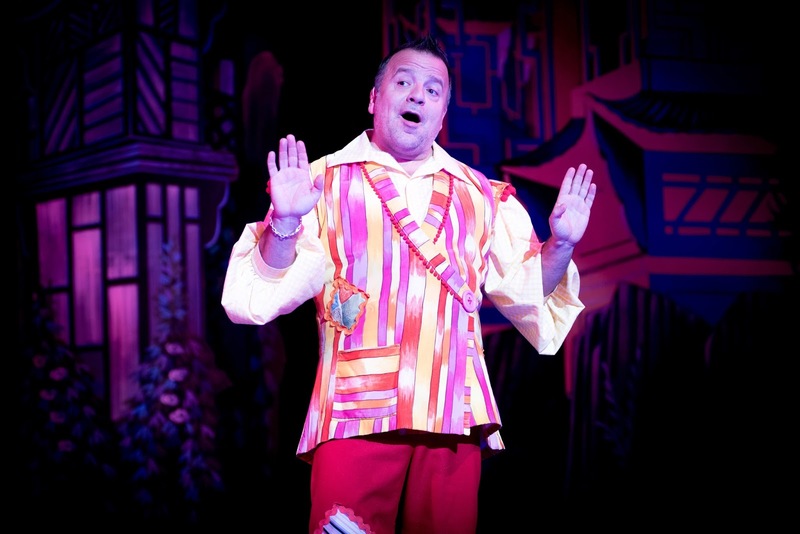 Finally from the main cast is Darren Machin's Widow Twankey, doing everything the dame of panto needs to do, look ridiculous in crazy costumes, true and fail to look like a woman and manage against all odds to be married to an unsuspecting gentleman character by the end. 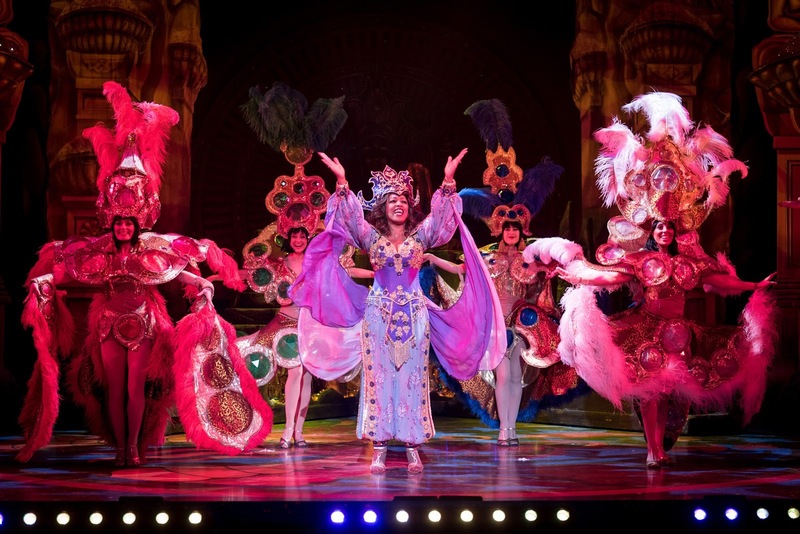 This production also has a very strong ensemble, which is given plenty to do and fills Aladdin with some big routines as a result. The set ticks all the boxes as well with its colourful backdrops, while the costumes, plenty of them as this is, of course, a panto, are a delightful collection of over the top colours. The script, from Jonathan Kiley and Alan McHugh, teeters on the right side of acceptable fodder, with more laughs than groans, has all the expected local references and has an especially brilliant tongue twister sequence brilliantly performed by Orkian, Machin and very badly (for the audience's appreciation) by Nicholas. A couple of years ago, I came away tremendously disappointed by the Derngate panto that year, Cinderella, due to its extremely poor balance with the jokes for its adult audience and attempting to make the star names more important than the show. It clearly sailed over the boundary for me, however, here with Aladdin, there is no such danger. This is perfect panto for all ages, it does what it says on the panto tin and then some. It's true that take away the quite brilliant Kev Orkian and you might have just an average panto, but with him at the Wishee Washee helm, he makes the ticket price worth it alone. Fabulous family entertainment, but you may always be wishing, Washee would return. Performance reviewed: Tuesday 12th December 2017 at the Royal & Derngate (Derngate), Northampton. Aladdin runs at the Royal & Derngate until Sunday 31st December 2017. Sheila Ferguson (Scheherazade) and ensemble.